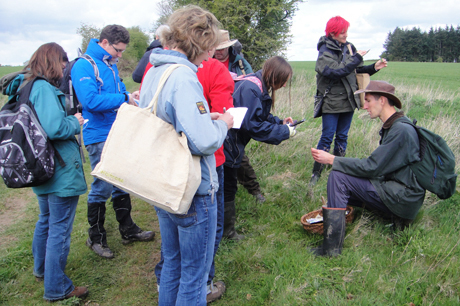 This year it was a birthday treat… so off I went on a foraging course with Hedgerow Harvest. 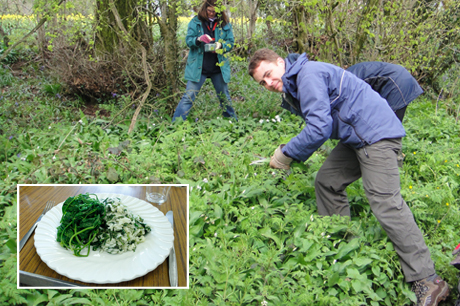 James, our expert, took a group of 12 through the countryside hunting out delicious free spring greens and we discovered about 30 edible plants. James explained what we could eat, how they can be used and what to be wary of. There is so much out there and I can’t wait to try nettle pesto, nettle beer, dandelion fritters and a foraged salad. I was delighted to rediscover a childhood favourite christened ‘yum-yums’ which is in fact wood sorrel as well as finding tasty crow’s garlic and wild garlic. After about four hours of walking and learning in the woods, we went to a village hall to cook our foraged meal. We made nettle soup with garlic bread, nettle risotto with spring greens and Japanese knotweed crumble. It was delicious and so satisfying and as Hedgerow Harvest also offer courses on ‘Fruit and Nuts’ and ‘Fungus Foraging’, I will certainly return.